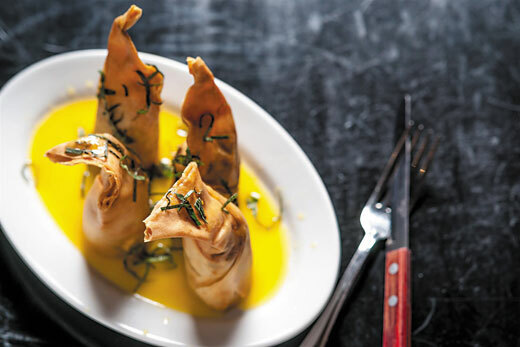 As spring is beginning to emerge ending one of the longest winters in the history of NYC, it’s time to shake the blues and come out of hibernation to experience the myriad of flavors that NYC has to offer. From American comfort food to the elegant and classic Mediterranean cuisine, to the vibrant flavors of Korea, Thailand, and India to the exotic fiery flavors of Mexico & South America, the foodie scene is alive and well in NYC, and we have scoured the city and beyond to give you our favorites this month. 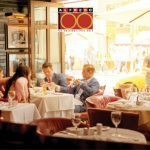 Set in the heart of NYC’s most exclusive shopping district on Madison and 62nd Amaranth is a Mediterranean neighborhood hotspot frequented by the area’s well-heeled denizens. 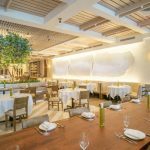 In a sea of expensive clichéd Madison Ave restaurants, Amaranth is an inviting space serving authentic Italian and French Riviera favorites that regulars – consisting of billionaires, Russian beauties and ladies who lunch have become accustomed to when stateside. Indulge in the brick oven baked Foccacia Robiola- a Portofino favorite, the near transparent thinly sliced octopus carpaccio, pan seared sea scallops, or dine like a lady who lunches on their hearty lobster salad. The fresh pasta dishes taste like you are in Rome with classics such as Spaghetti with pancetta and peas and risotto with wild mushroom. To ensure authenticity in their ingredients, the Parma ham is actually from Parma and the buffalo mozzarella is flown in weekly from Naples. Though Mardi Gras only comes once a year, relive the excitement at Midtown East’s latest Mardi Gras themed eatery, Masq which is adorned with Mardi Gras beads and masquerade masks to get you in the mood. Even if you can’t make it to New Orleans for some Cajun cooking, Masq whips up the Big Easy’s specialties such as Shrimp Etoufee, spicy Jambalaya, authentic Maryland crab cakes, Muffalatas, overstuffed Po Boys with fried catfish or shrimp, as well as artisanal flatbreads with toppings like fig and prosciutto and grilled vegetables. Leave room for dessert, sinful treats include the freshly baked chocolate cookie ice cream sandwiches or the chef’s rendition of a bananas foster with goat cheese stuffed wontons drizzled with brandy laced caramel and bananas. Day or night, it’s always Fat Tuesday here as the lively happy hour features live music in the back lounge playing the best of Zydeco, blues, rock, country, and jazz. As Top Chef Richard Sandoval scours the globe searching for to pair tastes and cultures from Latin America and Asia, his latest test kitchen combination is Japan to Mexico which is one of his most scrumptious collaborations to date. Though both countries are just an ocean apart, Chef Sandoval seamlessly weaves flavors and techniques from the street foods of these vastly different cuisines. New to the menu are the Achiote Shrimp Tempura Roll with crunchy achiote jicama and chile toreado aioli, and an Octopus aguachile toradito in a ginger green chili broth with soy, Asian pair, avocado and Nori. 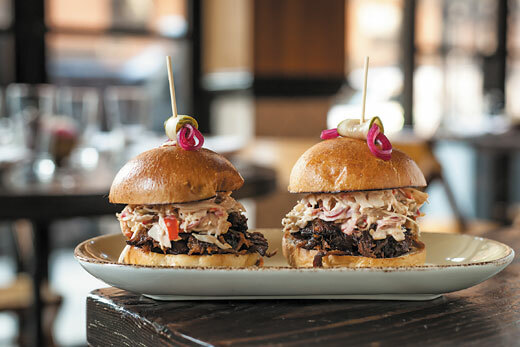 Meat dishes include teriyaki pork belly sliders with Oaxaca cheese, guacamole, and caramelized pineapple, and a kabayaki glazed lamb shank barbacoa enhanced with ginger, chilies, tamarind, and pickled vegetables. With the hints of spice, nothing pairs better with the spicy and robust flavors than the test kitchen cocktails. Wash it down with a shiro margarita or a calamansi Old fashioned with Japanese whiskey, calamansi juice and bitters. Don’t wait too long as the Test Kitchen menu changes every few months. As one of Midtown West’s favorite hotels, the Park Central Hotel recently underwent an extensive multi million dollar renovation and has been reimagined by award winning designer Jeffrey Beers who created a new look inspired by the iconic landmarks around the neighborhood. 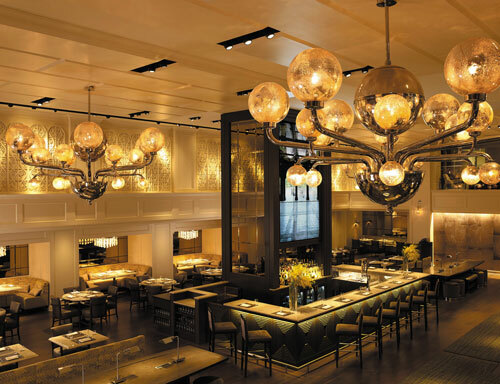 At the heart of the lobby is the signature restaurant, Park Kitchen, headed by Executive Chef Nathaniel Eckhaus who has previously worked at Eleven Madison Park and South Gate restaurant bringing his flair for using local provisions to create contemporary American dishes. Comfort food has been tweaked with gourmand touches with small plates such as PB&J- braised pork belly & pepper jam sandwiches, fried chicken with pickled egg and house made sweet hot sauce, and Brooklyn lager battered fish & chips. Indulgent sweets include a rich chocolatey Mississippi mud pie and New York cheese cake. As the ‘NYCentric’ themed menu pays homage to its hometown- the drink menu also reflects the same kind of inspiration with locally sourced craft liquors. The Staten Island Frappe features Bacard, Oakheart rum, pineapple juice and sasparilla bitters, and the Manahatta features NY state corn whisky, Martini bianco, peach bitters and sweet pickled baby corn all created by NY Native mixologist, Nick Mautone. 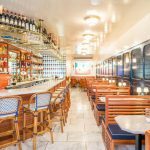 Whether it’s a quick bite, a casual drink or a pre/post theatre meal, the inviting Park Kitchen is a compelling dining destination near Central Park. 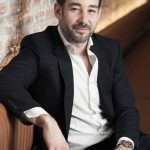 Tucked away inside the historic Iroquois Hotel in Midtown is Triomphe, a modern French formal restaurant with a menu created by Swiss native, Executive chef Florian Wehrli. True to the French cuisine many of his signature dishes are infused with champagne or fine wines in inventive and elegant ways. The fresh East coast oysters are adorned with champagne pearls as its mignonette, as well as the seared foie gras and duck confit napoleon that is drizzled with a port reduction sauce. 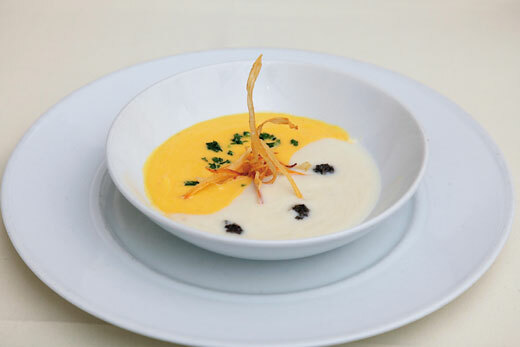 To whet the palette try the velvety harlequin cauliflower soup accented with black truffle. Chef Florian displays his ambitious talents with his main courses that take French haute cuisine to a new level. Crema de bleu stuffed beef tenderloin is paired with an onion marmalade, monk fish osso bucco has a pinot noir sauce, and Maine lobster is poached in butter sauce making for a rich finish. While everything is sourced locally, the menu changes seasonally to reflect the farm to table experience and surprise our palette with new flavors. What started as a weekly supper party two years ago has blossomed into Comodo. Translating to comfort, Chef Felipe Donnelly cooked and his wife Tamy Rofe played hostess and blogged about their weekly dinner parties where they invited complete strangers to their apartment until they were shut down by the health department. 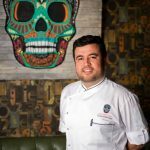 With Columbian roots, Donnelly is heavily inspired by the comfort cuisine of his native country with influences of his experiences in Spain, Brazil & Mexico. 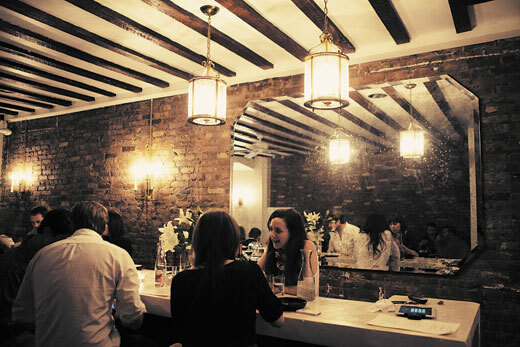 A true testament to their love of food, Comodo evokes an inviting yet romantic vibe with exposed brick walls, conversation over shared dishes lit by soft ambient lighting in West Soho. The improvisational feel of the dishes infuses every dish with fresh flavors and textures like the mezcal cooked octopus over apple cider braised kale, a fresh daily ceviche in lime celery juice and corn nuts, chipotle rubbed cod, Columbian ajiaco soup with 3 different potatoes, guascas, chicken, avocado, corn and capers, and Brazilian braised leg of lamb stewed with coconut milk and tomatoes. Dessert is simple yet rich with the coconut cake aptly named 7 pounds, classic churros & cocoa, and the Brigadeiro chocolate cake with saffron sauce. Not to be missed is their Sakerinha which is a Japanese influenced caipirinha made with sake and their house made sangria which comes from a secret recipe and is amongst the best in the city. 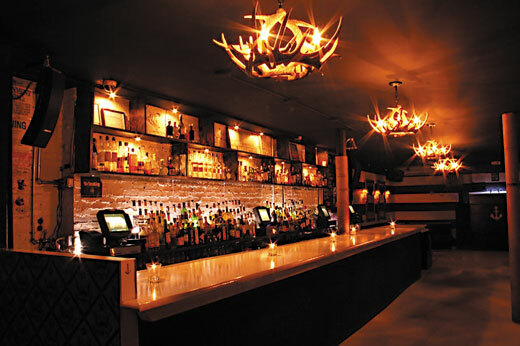 Marked by just an anchor over the front door, don’t be fooled by the simple façade of this West Soho bar and lounge. Open from 10-4 on Thursday to Saturday, the crowd peaks around midnight and becomes packed wall to wall with “the beautiful people.” Reminiscent of the nightlife crowd frequenting the Hamptons but without the hassle and pretension or mandatory minimum bottle service, the energetic crowd is comprised of junior associate bankers, girls in Herve Leger-esque minis, and parties celebrating their 25th birthdays who are all out to have a good time and shimmy to some of the top celebrity DJs in the city like Mark Ronson, Mel Debarge, Mos, Q Tip or Alexandra Richards to name a few. Or perhaps what gets the crowd going is the punch bowl sized potent elixirs crafted with 5 types of liquor that are dangerously smooth. 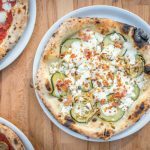 While NYC has its fair share of pizza joints, Artichoke Pizza stands out from the crowd. Self declared Pizzaiolos, cousins Francis Garcia and Sal Basille grew up in the pizza making business at their family’s restaurant Basille’s in Staten Island. 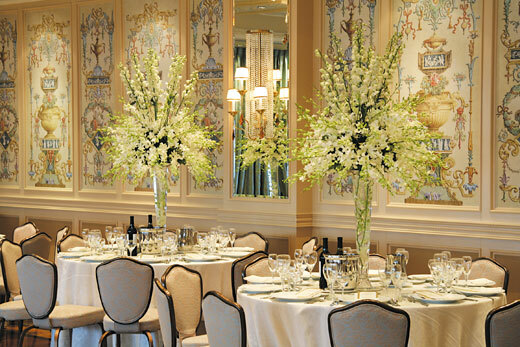 Since 2008, they have expanded their operations to 4 locations throughout NYC. 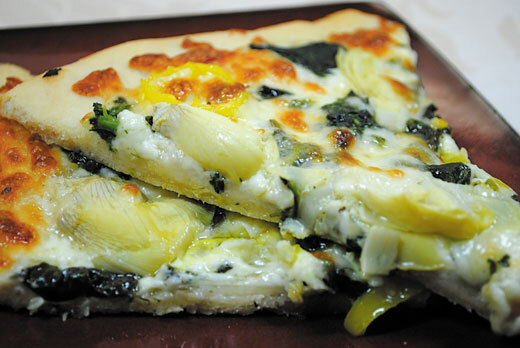 Dedicated loyalists swear by the filling artichoke pizza which uses artichoke hearts, spinach, cream sauce, mozzarella and pecorino cheese or the stuffed artichoke brimming with garlicky goodness. Other favorites are the vodka Sicilian dripping with a rich tomato vodka sauce and mix of Italian cheeses, and the classic margherita pizza with a robust marinara sauce, cheesy top, and thick crust. With its close proximity to the heart of NYC’s nightlife, expect to see celebs and club kids stop in to fuel up for a long night of late night revelry. 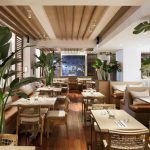 While Nolita hotspot Ken & Cook has been known for their trendy scene, the menu got a revamp thanks to newly appointed Chef Hido Holli who changed the offerings from American comfort food to a Provencal Mediterranean menu. 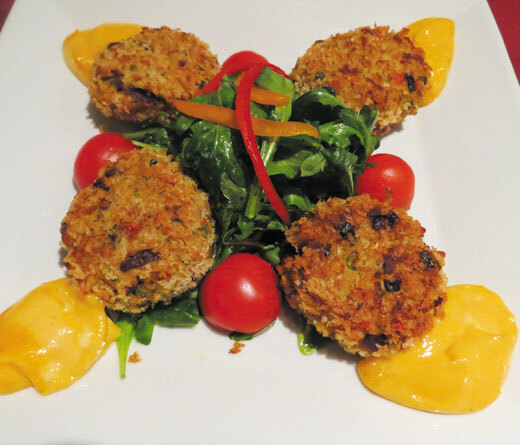 While their famous seafood raw bar tower remains along with their imported charcuterie and cheese plates, main courses tend to be more seafood centric with an Alsatian flair. 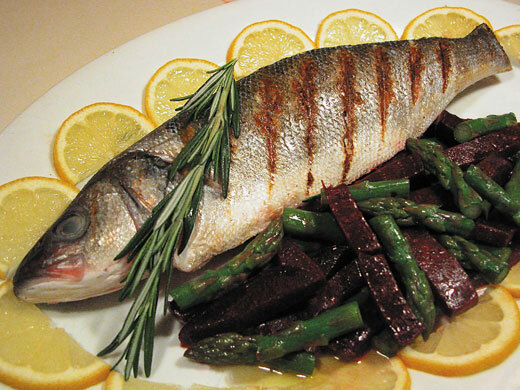 Chef Hido excels in classic French bistro fare like a seafood bouillabaisse is chock full of shellfish and branzino in a rich seafood tomato broth, whole branzino with herbes de provence, olives and pequillo peppers, salmon avocado tartare as well as meat classics like, braised lamb shank, cote de boeuf, and aged strip steak and frites. 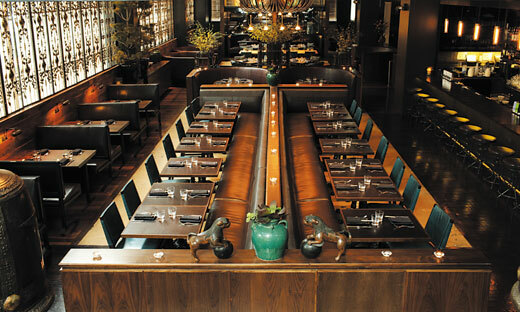 On Sundays enjoy 50% off all bottles of wine with any entrée as well as live jazz that fills up this hotspot. Comfort food comes to Noho with Bleecker Kitchen & Co. Soho shoppers and NYU students will delight in the regional East Coast American fare spanning from the South to the Northeast that our palettes adore. Low country favorites like fried chicken and waffles with maple syrup, shrimp and grits, root beer braised short ribs are as authentic as what you’d find in the good ol’ South. For dedicated Northeasterners the Maine lobster roll is made the same way as a seafood shack in Kennebunkport and the NY Strip steaks is actually sourced from a NY state farm. The warm ambiance has a retro feel with white tile and exposed brick walls, wooden plank floors, and a mural constructed from a vintage basketball court. Whether it’s a NY State craft beer or a bespoke cocktail, Bleecker Kitchen takes their drinks seriously, which is a refreshing change in a city that sometimes takes itself to seriously. Modern twists on classic drinks like their Manhattan with additions like cynar amaro and cacao as well as the concord mule with vodka, meyer lemon, concord grape, ginger, and thyme make it a perfect spot to experiment with craft cocktails. A native from Thailand, Chef Hong Thaimee was first an international fashion model and TV personality before she decided to pursue her love of Thai cuisine. Trained under the most famous chef in Thailand, she has also worked in some of the most famous Thai restaurants in the city including Spice Market and Kittichai and competed on Iron Chef America. Bringing a modern approach to Thai comfort food she uses traditional Thai flavors with local ingredients and even teaches cooking classes so you can take the flavor of Thailand home. While everything on the menu is outstanding, mouthwatering favorites include the sticky tamarind chili sauce hot wings, Thai taco with pork belly, Tom Klong- a crispy pork belly wrapped shrimp in a tamarind and Thai basil broth, lobster dumplings in soy curry and pickled mustard, the Dark Knight with squid ink noodles, fried calamari and black pepper sauce. and of course the crispy roasted Long Island duck accented with lychees, curry and a Thai basil sauce. As Thailand is known as the “Land of Smiles,” love is in the air at this feel good restaurant with a large lit red Love sign hanging on the exposed brick wall which reminds its patrons that every dish is delicious because it’s made with love. 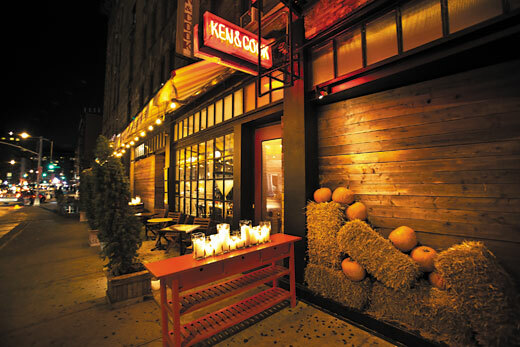 For authentic nouveau Korean cuisine, skip the frenzy of K-town and head to the West Village. Whether you’re feeling adventurous and want to try your hand at grilling or want to taste executive chef Myung Ja Kwak’s home cooking the choice is yours with tables featuring optional built in BBQ grills. Dishes range from classics like bibimbop that come with traditional and innovative toppings like bulgogi as well as spicy squid or codfish cakes to unique offerings like jalapeno crispy chicken, soy marinated and grilled cod, and steak gui- thinly sliced tenderloin tantalize the palette. Groups of 4 or more can indulge in family style menus with generous portions of BBQ options like spicy pork bulgogi, kalbi shortribs, japchae, and seafood pancakes, with dishes ranging from mild to fiery. Cool down the flames with a refreshing cocktail such as the Paper lantern with sake, apple cider, passionfruit and yuza or the sake breeze with sake, muddled cucumber, fresh mint & lime or the cooling Yuja martini with vodka, yuja, champagne, and lemon sorbet. If you’re lucky you may even spot Do Hwa’s famous co owner, Quentin Tarantino, who decorated a wall with his movie posters, and is known to frequent his hotspot. 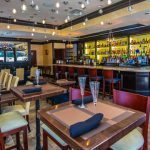 After successfully opening the Michelin star rated Indian favorite Tulsi, owners Vijay Rao and Jimmy Patel have brought the same concept with a Bollywood inspiration to Secaucus with Dhoom Restaurant. To get diners in the mood, Bollywood music plays in the background and walls are smattered with the colorful posters of famous Indian Bollywood films with the menu taking cues from the movie industry. Start with the trailers (appetizers), starring roles (main courses), co stars and supporting roles- vegetarian and meat dishes, and finish with the sweet endings (dessert). To truly experience Chef Ram and Chef Matur’s culinary talents order the Blockbuster Maharajah 5 course tasting menu for only $40 with Northern Indian specialties such as the Afghan Chapli Kabab featuring spiced minced lamb over greens, Tandoori Khazana with tiger prawns, lamb chops, murgh malai and reshmi kabab, chicken tikka masala, and the chef’s selection of desserts. A vegetarian version is also available featuring tandoori style roasted vegetables, paneer cubes in a rich tomato gravy, and a Portugese green soup. Other a la carte standouts include the fiery Bombay to Goa Lamb Vindaloo, crispy cauliflower in a spicy chili garlic sauce, tikki crab in a curry and ginger sauce, madras pepper shrimp, and steamed coconut halibut cooked in banana leaves. While it’s hard to convince New Yorkers to cross the Hudson to NJ, a trip to Dhoom is well worth the hike.